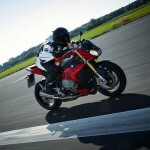 Motorcycle News 2014: BMW S1000R, the Bavarian roadster! Small arms refrain! 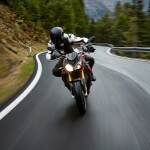 With 160 hp and 11.2 daN.m of torque provided by its 4 cylinder engine derived from the BMW S1000RR, mounted in a frame cut to the scalpel, the new sports roadster BMW S1000R is shaping up more cattle. Equipped with a complete electronic package, including traction control fully parametrized, the brake assist, several maps and optional suspensions driven, the Bavarian manufacturer provides the driver weapons for taming the beast! 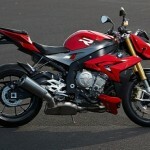 With the BMW S1000R 2014 (that we presented you some time ago already), BMW landed unceremoniously on the niche of the big sports roadsters. 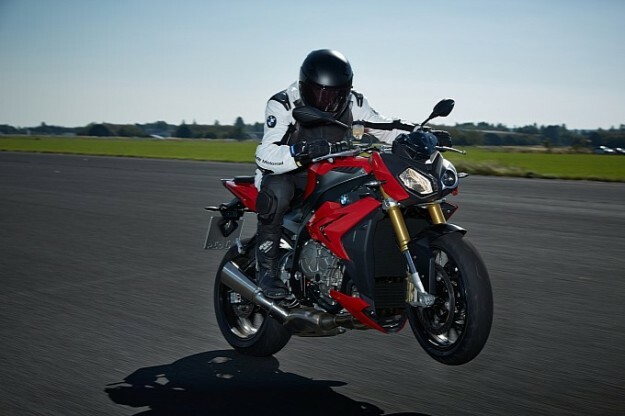 Indeed, the Bavarian manufacturer presents today to the EICMA 2013 a motorcycle among the best-performing segment, while retaining a particular content weight. 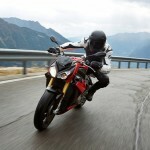 Derived from the BMW S1000RR hypersportive, it couldn’t be otherwise! 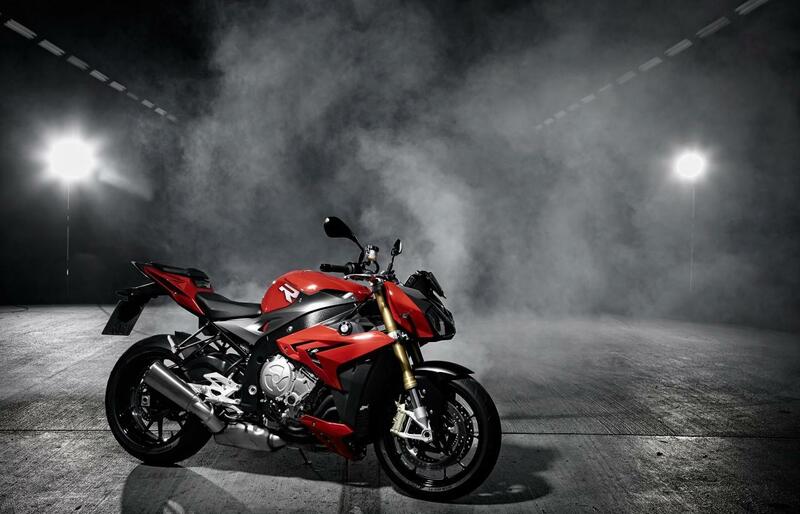 With its 160 horsepower at 11, 000 rpm, maximum torque of 11.2 daN.m value set at 9250 rpm and its weight all full facts announced at 207 kg, on the face of its technical specifications the new BMW S1000R 2014 can only impress. At the top of this category, the comparison (of the free world!) 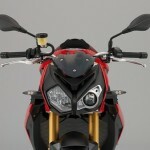 with the new KTM 1290 Superduke R (180 horsepower, 189 kg dry), the Aprilia Tuono V4 APRC (167 horsepower, 180 kg dry), see same the Ducati Streetfighter S (155 horsepower, 167 kg dry) announces to the less muscular, see outright bodybuilder! 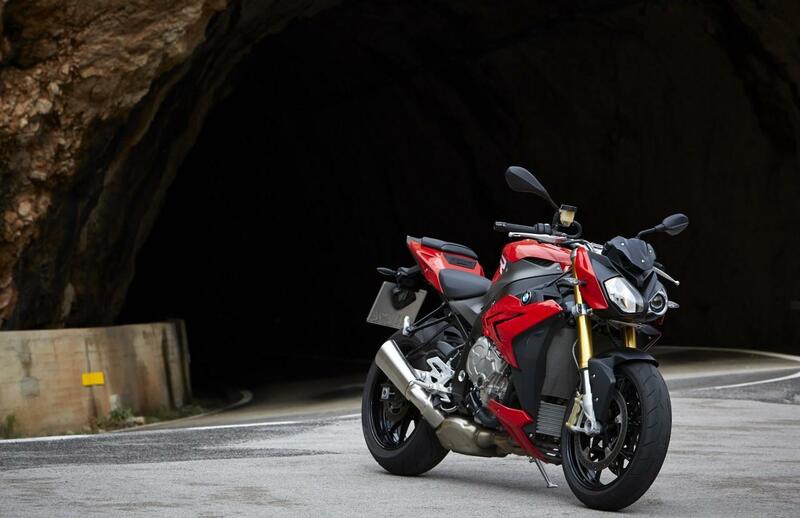 Before make you such a confrontation at the top, and of course the full test of this nasty roadster coming very soon, here’s what you should remember the BMW S1000R, a model whereas the efficient RR in since 2009. The asymmetrical style of the Bavarian House persists here yet. 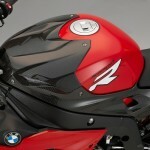 The two faces of the BMW S1000R, half -roadster half-track, therefore are facade on the nose fairing at the differentiated lights, as on the flanks, with different fascias on right and left side. 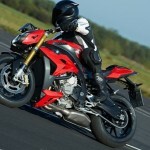 Under the wrapping purified from the German, the revamped 4-cylinder housings are revealed with less of modesty on the BMW S1000RR sport. 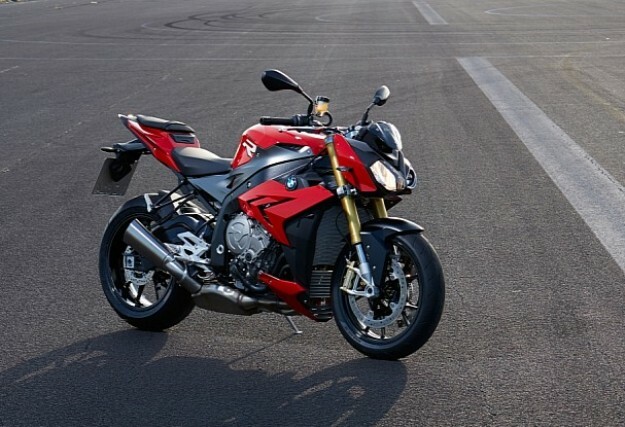 Adapted to the roadster segment, its sheer power is less (160 hp against 193 hp on the BMW S1000RR), but its low and midrange torque would be more important. 4 Cylinder 999 cm3 is therefore not truly domesticated; it is simply more filled in on the useful to the genus phases. Thus, up to 7500 rpm, the engine of the BMW S1000R venting 1 daN.m of torque greater than the sporty, but its maximum speed would be lowered from 2000 rpm. 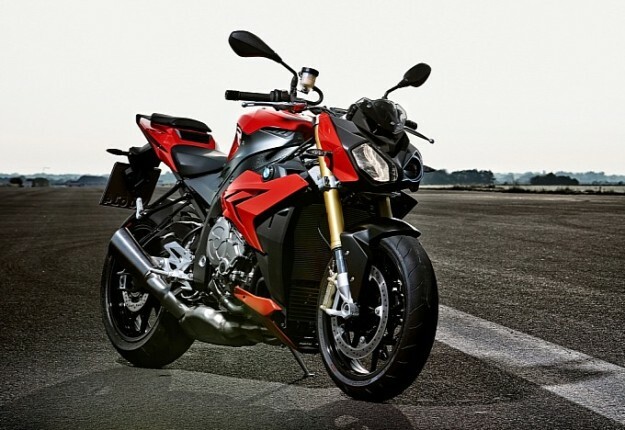 In detail, the engine of the BMW S1000R, like that of the BMW S1000RR, adopts a system of phased, fully sequential fuel injection, with dual injectors per cylinder. However, internal pipes and lift of cam curves vary, as also the profile of the latter. 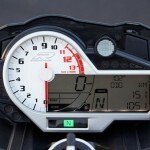 Thanks to the system of engine management BMS – X (BMS – KP on the BMW S1000RR), the roadster has an electronic throttle control type ride by wire. The exhaust line is the same as the final transmission system and the box 6. 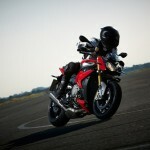 The shifter option is also available on the BMW S1000R. 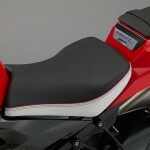 A new dashboard and new features appear on the BMW S1000R. On its LCD screen, in addition to the standard information and those provided by the on-board computer, can read the ratio engaged, active mode and timing its laps (with information on the percentages of braking and acceleration or the number of reports crossing). 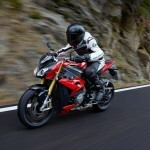 The pack of electronic audience of the BMW S1000R 2014 is identical to that of the BMW S1000RR sport. There is traction control ASC and the Race-ABS brake assists. Their level of intervention is set in two modes: Road or Rain. Naturally, the first mapping provides an optimal response to the acceleration and the little intrusive audience, the inverse of the second mode where power and torque are clamped (136 c and 10.4 daN.m), ABS and the CSA also involved earlier. Here, too, we pass from one mode to another by rolling, by simply releasing the throttle. 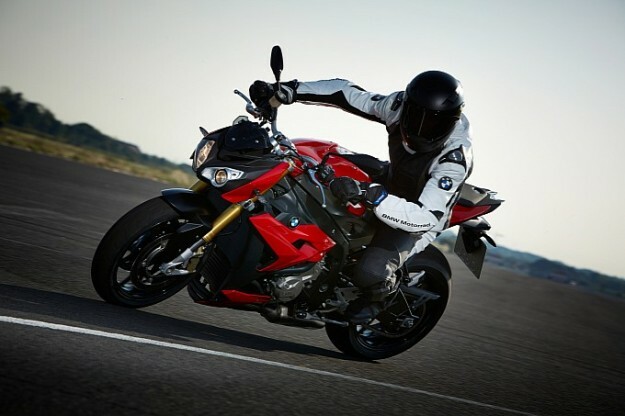 To fully benefit from the BMW S1000R on track, BMW offers optional two other modes: Dynamic and Dynamic Pro, with a rich traction of a detector of angle inlet. In Dynamic Race-ABS threshold is raised, the detachment of the rear wheel sensor is removed and traction control is late. In Pro mode another cap is exceeded, the ABS is then more than on the front wheel and wheelies are allowed. 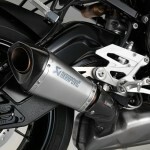 As on the BMW S1000RR, BMW S1000R engine at 32 ° (supporting member) is integrated with the only 11.98 kg aluminum perimeter frame. Weight hunting does not stop there, the roadster adopting for example a tank it also consists of this beautiful alloy. 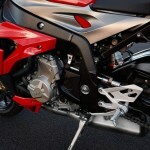 We find the same set of suspensions on the sporty, fully customizable, and the presence of a steering damper. Logically, the geometry of the roadster differed from the sport. At the front, the angle of the fork is closed 0.8 °, while hunting is 5 mm longer. The 1,439 mm wheelbase, is extended to 22 mm. 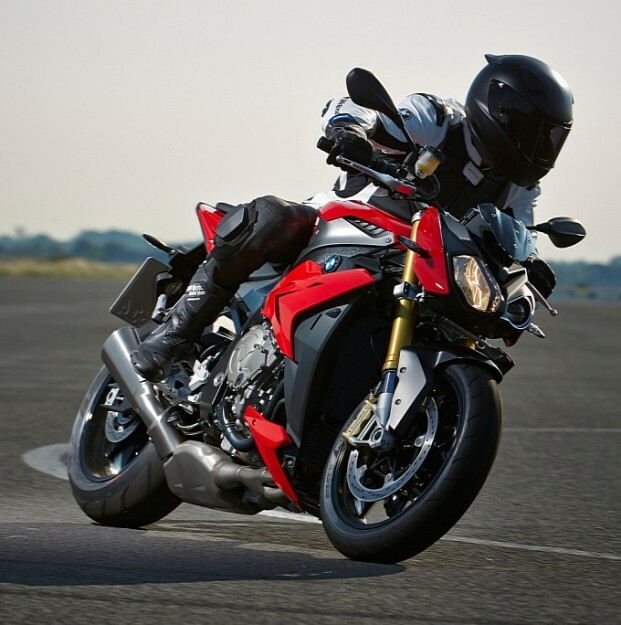 Optional, BMW S1000R 2014 can be equipped with dynamic control of the damping DDC, an appeared suspensions driven system about the HP4 of the BMW S1000RR version. This DDC adapts to different maps available on the roadster. 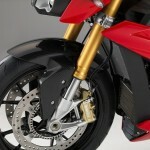 Wheels and disc brake calipers of the BMW S1000R are identical to those of the RR. The sport is deemed to be particularly good brakeman, the system should provide the roadster a slowdown loggers more convincing. Note that the BMW Race-ABS is complete only when the front is requested, it can also be set according to the modes, see totally disconnected. 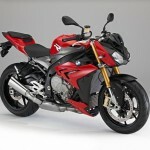 No information about the availability of the BMW S1000R is currently available. Side tariff is the same thing, the base price of the roadster is not yet known, normal that do these very many options and accessories present, as it’s usual, BMW catalog.